A Couple’s Hike | Florida Hikes! 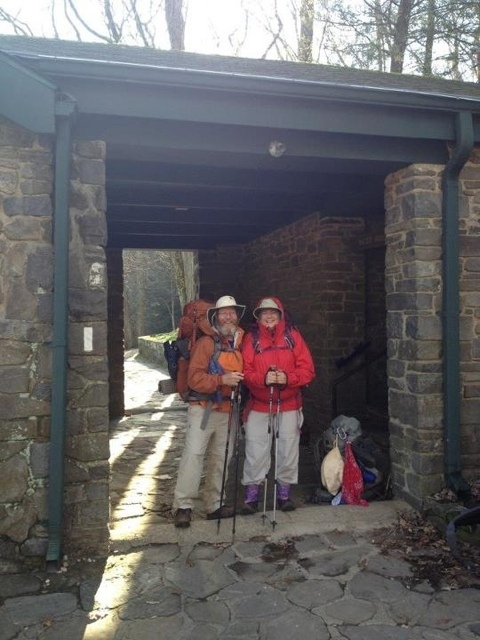 What’s it like hiking the AT as a couple? After years and miles being individual hikers, it’s what Sandy and I are learning. Living out of only two backpacks requires more team work, much more than just your everyday living. At home there’s a kitchen, with things like a stove, microwave and fridge. If the two of you don’t like the same foods, it’s easy to cook separately and there’s plenty of room for both your desires in the fridge or the pantry. Out here, there’s no fridge, our stove is small enough to fit in a jacket pocket, and there’s no place to plug in a microwave. So it comes down to “what can we cook in one pot” is our best meal choice. Something that we both like, and will provide us with the needed calories. We’re lucky here, because I will eat almost anything, and Sandy’s only food issue is watching gluten. We eat fine, and without using any of the prepackaged freeze dried meals. I often watch couples cook separate meals. Which works, but wastes a lot of time. I see many of them not even trying to work as a team. Back in the “real” world, the one with a kitchen, it’s easy. But out on the trail it’s a terrible waste of time and energy. One evening I watched a couple taking their turns at the stove to fix their meals. Sandy and I, on the other hand have become quite a team at everything we do. Most of our days start the same. Sandy gets the first privy visit. While she’s gone, I pack up the sleeping pads, sleeping bags, and loose items in the tent. On her way back to the tent, Sandy retrieves our food from the bear bag line. When she returns to camp, I hand her everything inside the tent. Crawling from the tent, I remove the hiking poles holding it up. Then while Sandy fixes our breakfast, I make my privy run. When we’re lucky, the water sources are along the trail. Being safe, we filter. I pump the filter while Sandy fills the bottles. It’s so much easier than doing it alone. If the water is down a side trail, we take turns retrieving it. Sometimes, if you’re lucky, it’s only twenty or thirty feet down the trail. Other times it’s not! Both of us have made almost a third to a half mile treks, just to get our water. At one shelter, I had been gone so long, that Sandy came looking for me. The best parts about being a couple are the things you get to share. The deer, a bright orange salamander, an unusual shaped tree, or just a beautiful view. Each day we become a little closer. When the trail is wide enough, we walk hand in hand. We notice different things. We look out for each other. I keep track of our snack and eating schedule, and Sandy makes sure that we’re drinking enough. Each time one of us slips or slides, the other is quickly checking that the other is okay. I’ve luckily only fallen once, on some very loose rocks. Doing a full turtle, on my back with arms and legs in the air. Sandy looked terrified. Afraid that I’d been hurt or could have continued sliding down the side of the mountain. I wasn’t alone, there was someone there worrying about me! And you can’t beat that feeling! Being a couple, you help each other through the low points. Luckily it’s rare to be having them at the same time! You help each other, using your strong points. Sandy’s a much stronger hiker than I am. There isn’t much out the that she fears. But she doesn’t trust her balance while doing a stream crossing on a log. With my lack of fear, or maybe sense, log bridges don’t bother me. I cross over, drop of my pack and return for hers. She safely crosses, more comfortably without the weight of the pack, and we continue on. Many nights, just before falling to sleep, we find ourselves chuckling over some little event of the day. We wake up each day with a good morning kiss and start a new day.